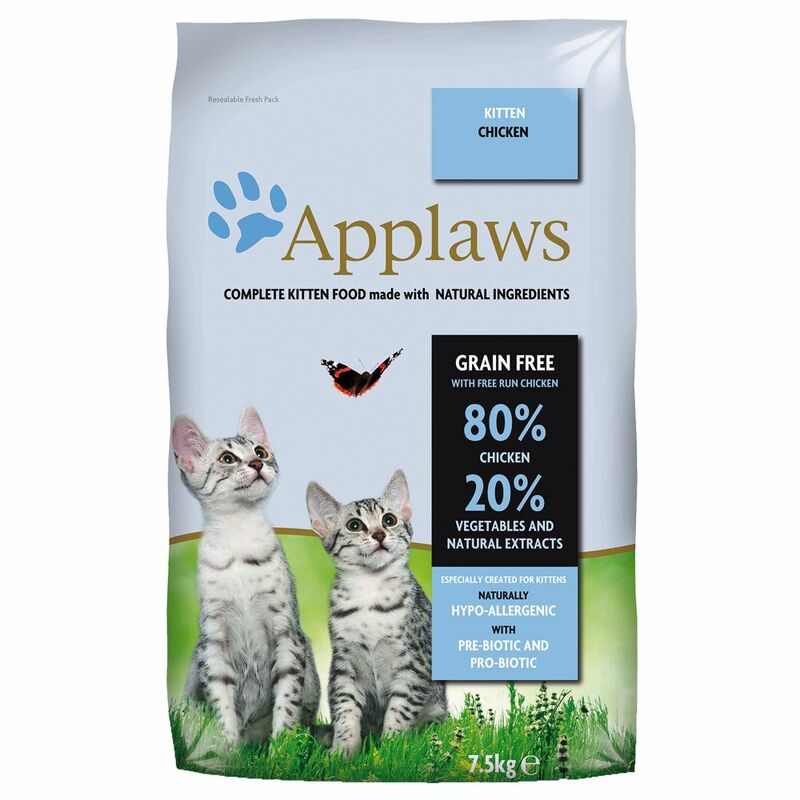 Applaws Cat Food for Kittens dry food is a perfectly balanced food for kitten, as well as pregnant or nursing cats. It simulates the natural diet of a cat in the wild in a dry kibble form. Cats are carnivores and their digestive system is adapted to thrive on a diet high in natural animal proteins. The natural cat diet only contains 1 to 5 % plant content from the intestines of prey. The grains found in many other dry pet foods cannot be utilised and are difficult to digest for cats. Surplus carbohydrates are not saved but are converted into glycogen or fat. The result can be obesity, liver or pancreas disease and even diabetes. Applaws Kitten dry cat food uses meat as its only source of protein, which can be effectively converted into energy by your cat. It is also suitable for cats with allergies and food intolerances. Applaws Cat Food for Kittens contains no artificial preservatives. Added antioxidants for longer preservation of the food are derived from natural selenium and natural tocopherol which can have an additional positive effect on your cat's health and vitality. Natural omega 3 and omega 6 fatty acids strengthen the fur and skin structure and give your cat's coat a gloΒy shine. Cat Food for Kittens also contains cranberry extract to support the urinary and digestive tracts. Applaws Cat Food for Kittens at a glance: Completed dry food for kittens, pregnant or nursing cats Ideal for cats with food intolerances or allergies 80% meat content: provides premium animal proteins that can be easily converted into energy 20% vegetables and natural extracts: provide valuable fibre, vitamins and minerals Low in carbohydrates Grain free: Cats do not find grains easy to digest or metabolise. The results of consuming foods with high grain content can be weight gain, diseases of the liver or pancreas or diabetes Free from artificial colours and preservatives Omega 3 and omega 6 fatty acids: promotes healthy skin and a shiny coat With cranberry extract: offers natural protection against harmful bacteria and supports the urinary and digestive tracts Yucca extract: Can reduce unpleasant urine and faeces odour and promote healthy gut flora Balanced calcium and phosphorus ratio Anti-hairball formula Resealable packaging. Price just £65.99! Click here to buy now!